Van van is derived from the french-Louisiana pronunciation of vervain as "vaah vahn". It is traditionally created from 5 oriental plants; citronella, vervain, lemongrass, galangal, and patchouli. Though recipes vary slightly from worker to worker. All van van should contain lemongrass, some contain ginger or gingergrass. I use a relative of ginger-galangal root and ginger. This the BEST all purpose powder! Dress anything you like with it for extra oomph! It reverses bad luck, opens doors, creates opportunity, protects, and calls good fortune near! How can ya go wrong? 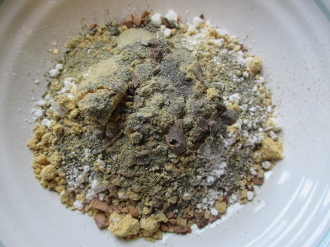 Created with powdered vervain, ginger, lemongrass, patchouli, galangal and pyrite.